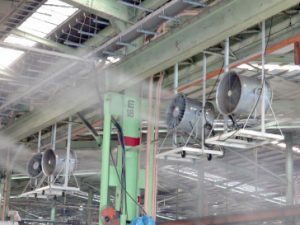 Dispersing fine fog (Semi-Dry Fog®*1) using a fan, this energy-saving cooling and humidification system (mist fan system) lowers ambient temperatures by 2–4°C via evaporative cooling and boosts humidity levels. Suitable for large indoor spaces, buildings with constantly open entrances, and other such locations where conventional cooling and humidification systems are ineffective, this system provides outstanding results in terms of lowering room temperatures, preventing heatstroke, keeping dust down, and more. *1) We define Semi-Dry Fog® as a fog with a mean droplet diameter (mean fog droplet size) of 10–30 μm. Because this fog system uses fine droplets and does not include large droplets which can result in wetting of objects and surfaces, it provides superb performance quality for human users. “Dry mist“, despite its similar same, has no specified droplet diameter as part of its definition. Dry mist droplet sizes vary significantly by producer and product.